It’s one of those statements that looks intelligent if it comes from somebody who is presentable as being intelligent. The “Provincial Gas Tax” is shown as 14.3 cents per litre in both pies, and there is no indication in the tweet, pies, or reality, that the carbon content of a litre of gasoline has changed. Burda’s description of that as a “REVERSE CARBON TAX” is dumber than her understanding of when a capital letter is appropriate. This is why I am hesitant on a carbon taxation; the most vocal proponents don’t speak intelligently on the topic, and they aren’t looking for a tool that will allow markets to find carbon mitigation measures – they are usually looking for a revenue tool to carry on their pet idiocy. When the Ontario Power Authority (OPA) released data projections made in supporting the development of Ontario’s latest Long Term Energy Plan (LTEP) they showed the cost of purchasing generation from solar would grow about $280 million in 2014 (in 2012 dollars), and $443 million in 2015. The OPA anticipated that 45% of the growth in in generation costs from 2013 through 2015 would be due to the costs of purchasing production from solar panels. 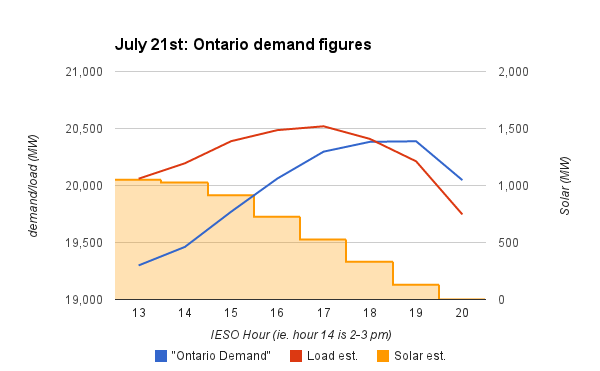 I’ve spent some time trying to incorporate hourly estimates of solar input into my tracking of Ontario electricity data. It’s not easy, and it’s dynamic, so I’m writing this post to explain how I’m estimating solar production, why my estimates change, why they are better than anything else most, if not all, will see – and what the estimates show. 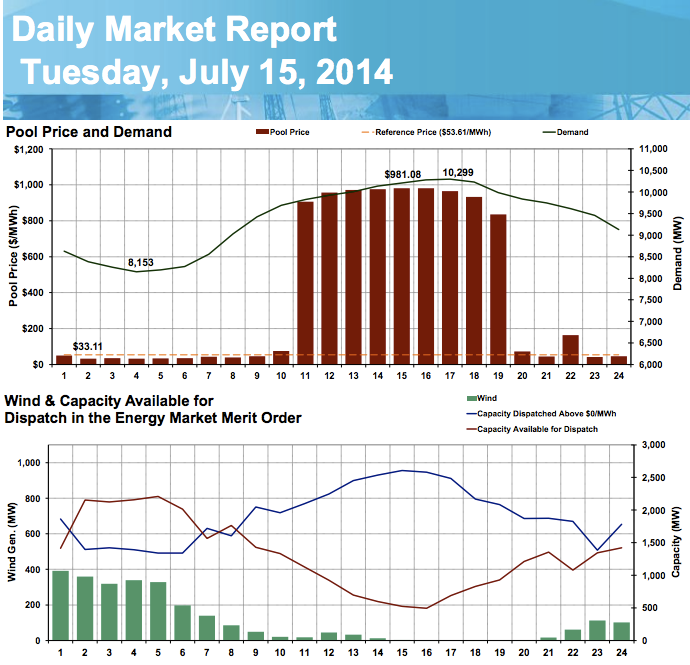 I saw that Alberta was setting demand records the past couple of days, so I visited the Alberta Electricity System Operator (AESO) website to see how wind generation contributed to meeting peak demand. I say not surprisingly because I’ve written on this before, in July 2012. Alberta has some comparatively strong wind resources, and seeing that it gets most electricity from coal, I can’t feel too strongly about the increase in wind turbines there. However, the lull during this latest record does again demonstrate that industrial wind turbine output has little capacity value, can’t displace firm generation, and is a low quality, low value, electricity generation source. The Mowat Centre study may or may not have been terrible, but the timing of its release certainly was.